Of all my Facebook friends, I have one very special friend named Arnest, a little boy who I befriended following our medical mission to Roxas City last year. He is a former patient of Mending Faces, and has already had two surgeries, one for his left cleft lip and the second on his palate. Nestlene, his mother, has kept in touch with many of us who have gone on past trips to the island of Panay. Facebook has proven to be a wonderful way for Mending Faces to maintain contact with our patients, and has spawned new ideas of how we can follow up on outcomes, and learn more about the post-op issues of our patients. We decided to send a few interview questions to Nestlene to learn more about the impact, both short term and long term, of the work that Mending Faces does. Arnest has also become the Mending Faces “poster child” promoting awareness for Mending Faces on a billboard located on 18th Street in downtown Denver, Colorado. Mending Faces (MF): What impact has the cleft lip and palate surgeries made on your son’s life? Nestlene: After the first operation Arnest opened himself up to people around him and gave him a life anew. MF: What has this surgery meant to you? Nestlene: It gave me big hope that my son will gain more confidence. I cannot afford to pay for his operation, and when I heard the Mission of Mending Faces I felt so happy for my son, much more when his first operation finished. MF: Have there been any changes in your son’s attitude, confidence? Does he socialize more now? Nestlene: Yes, plenty of changes! After the operation, he become more jolly, socialized, and felt so confident! MF: Has there been anything challenging after the surgery? Nestlene: Plenty of challenges came after the surgery. When there was a bit of pain in Arnest’s mouth, we went straight to Dr. Hilario. He has become the very best of friends to Arnest, he even called him Uncle Doc. Dr. Hilario is the only doctor that Arnest wants to see, even if he has another sickness, he wishes to see Uncle Doc. MF: What differences have you noticed in your son since the surgery? Nestlene: He has become happier and very confident, but as he got older and started to go to school, he become a little bit ashamed to talk because of troubles with his speech. Nestlene: We are very much thankful to Mending Faces, to the Doctors and all the people who support Mending faces. I still wish and pray that his speech will improve after his 3rd operation. Keep up the good work and god bless your upcoming trip here in the Philippines. The Mending Faces team is hoping to have Arnest join us in Kalibo in just one week, and help to comfort other young patients who may be nervous and apprehensive about having surgery by sharing his success story. The responses in this interview are hopeful, yet also illuminate the need for continued speech therapy in some of our patients. 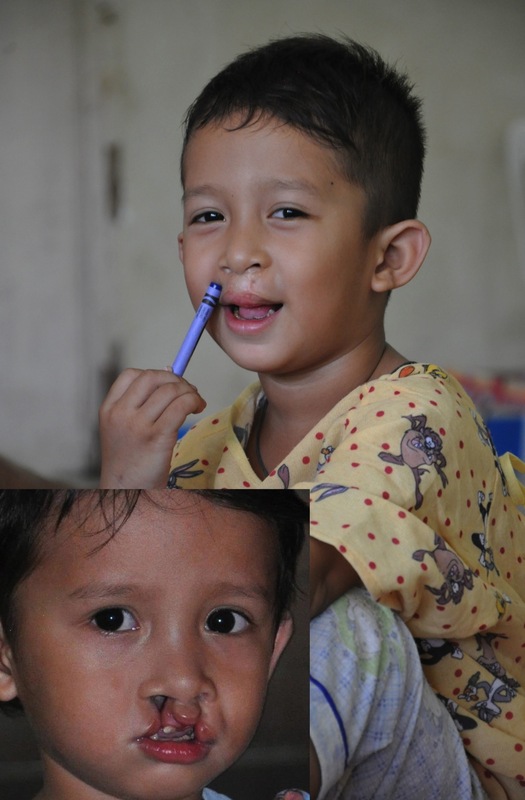 With two speech therapists joining us from a Norwegian cleft team this year, we feel confident we will be able to help Arnest and his mother address the speech issues that can continue post-op. They also will work with new patients and their parents with take-home speech therapy instructions as needed. It also reminds us that the work continues and with the help of our benefactors, volunteers, and Mending Faces missioners that come from far and wide, our combined efforts are truly making a difference! Thanks to all of you for your support. Be sure to get your friends and family to sign up for the e-blast to follow our trip departing on February 6th, so you can enjoy the inspiring and hopeful photos and stories as they unfold!